You can scroll down to see all the world map posters or use the links to jump directly to a specific category. Regular Maps – When all you want is a plain map. Children’s & Kids Maps – Perfect maps for kids. Historic Maps – Various poster prints of historic maps. Vintage Maps – Maps with a vintage look and feel. Push Pin Maps – Mark all the places you’ve been on these posters. Map Art – Posters that are a bit more artistic, rather than geographically accurate. 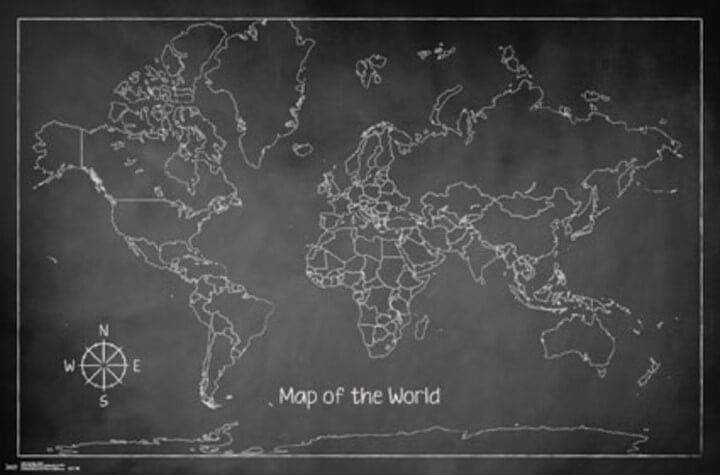 Black and White Maps – Very simple and minimalist maps. Laminated Maps – Perfect if you want to keep your map protected. Large Maps – For those with extra large walls. Other Cool Maps – Includes scratch maps, dry erase posters, and maps with stickers! 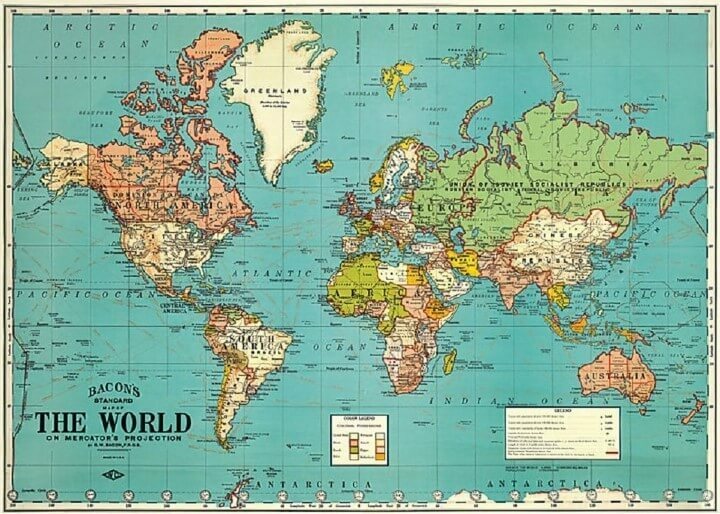 The world map posters below are perfect if all you want is a standard map of the world. Description: This high quality poster image is approximately 36-Inch by 24-Inch and is suitable for framing. The poster offers a lower cost alternative to a more expensive print or painting. Posters are perfect wall décor for any household or age range. 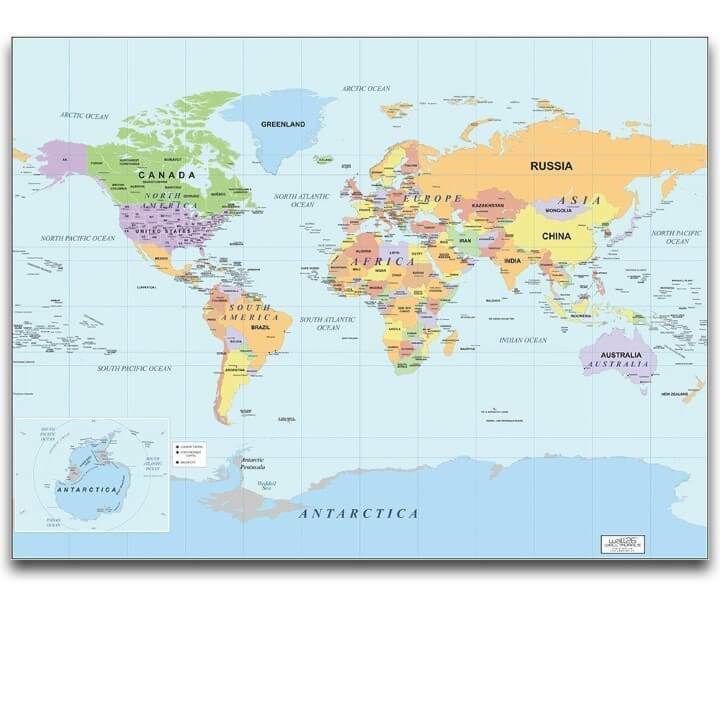 Description: 24×36 World Premier Wall Map Poster Mural. The map features a Miller Projection, which reduces distortion of land masses as they near the poles. Map features rich 3D shaded blue-oceans to give a unique and current world map style. All countries and continents are clearly labelled together with major World cities, major bodies of water and points of world interest. The land masses also include beautiful shaded topographic relief so you can easily view country elevations and mountain ranges. 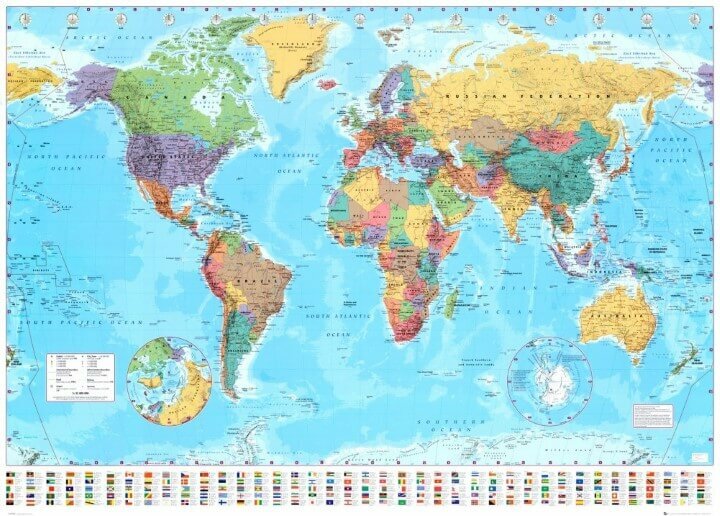 Description: Updated and redesigned, Rand McNally’s Signature World wall map features eye-catching bold and vivid colors that make this the perfect reference piece sure to stand out in any home, classroom or office. The Executive style World map uses an antique-style color palette and stunning shaded relief that provide a richness perfect for any decor. Drawn in the Winkel Tripel projection, distortions are minimized and unlike many other World maps, Greenland is show the same size as Argentina and not as the size of all of South America. 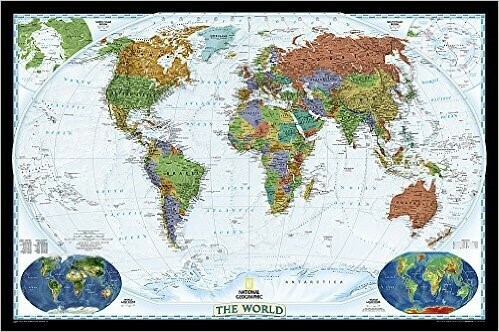 Description: This beautiful jumbo-sized poster is a great way for kids to learn geography. Features 100 colorful illustrations like the Eight Wonders of the World, the Solar System, Cloud Formations and Varieties of Terrains. Laminated on both sides for extra sturdiness and grommeted on four corners for hanging. Measures 35″ x 25″. Durable and long lasting. Laminated on both sides. Four corner grommets for easy hanging. 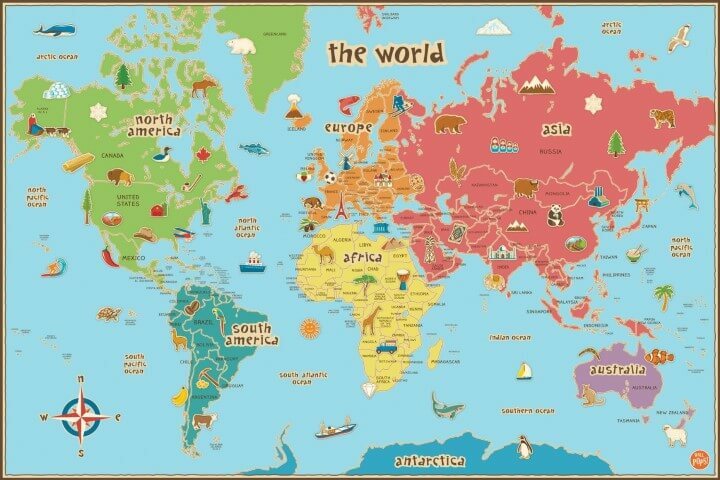 Description: This highly illustrated pictorial map is designed to take children on a journey of discovery around the countries of the world. The mapping is clear, colorful, and highly informative, and shows countries and capital cities. Stunning illustrations are used to depict themes such as national emblems, customs, food, birds, animals, buildings, and sports to help younger readers gain an understanding of peoples around the world. Description: Explore all regions of the world with the beautifully illustrated and educational map of the world. Every element of the map is hand drawn and beautifully illustrated – even the words are hand lettered, giving the image warmth and liveliness. This impressive map includes exciting pictorial illustrations of the world’s landmarks, major cities, bodies of water, key rivers, mountain ranges, architectural and cultural details of capital cities, natural resources and animal life, each in a style rendered in a playful and fun way created to entertain as well as educate. 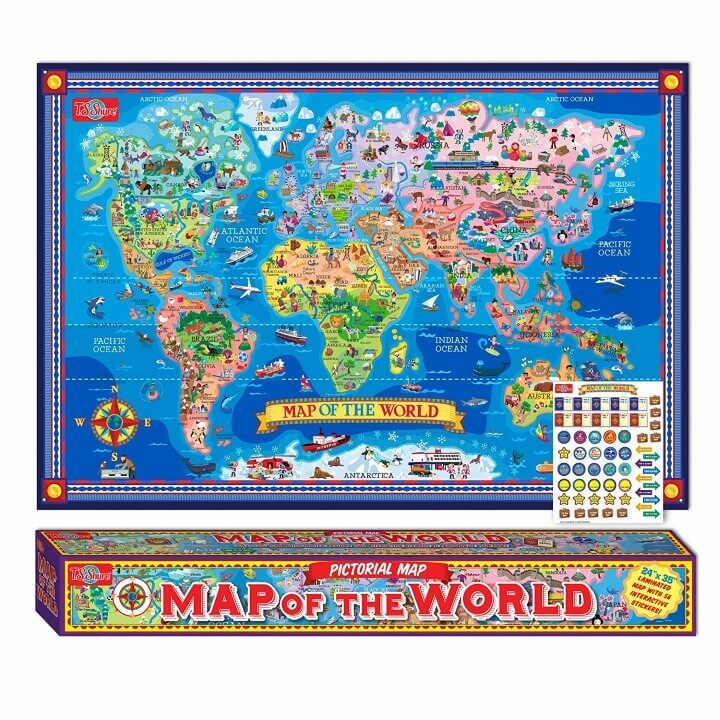 The map is made interactive with the 56 colorfully illustrated stickers – children and adults can place the stickers on the laminated poster to personalize the map. Sticker themes include places family members live, favorite locations, places you’d like to travel and more! 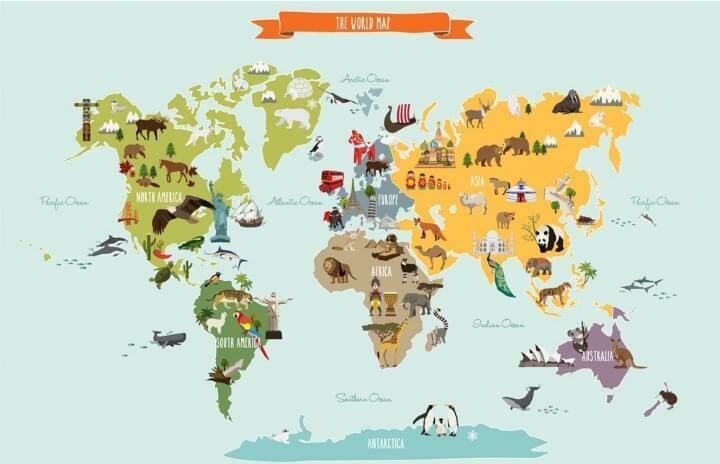 The illustrated pictorial map of the World poster measures 24″ tall x 35″ wide. The laminated poster has a grommet in each corner, making it easy to display and interact with in a classroom or at home. 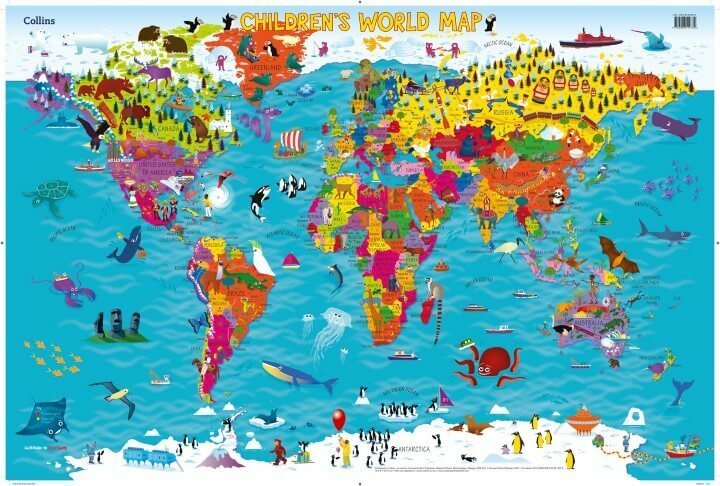 Description: This world map is especially suited to kids, with fun graphics, easy to read tags and bright colors. 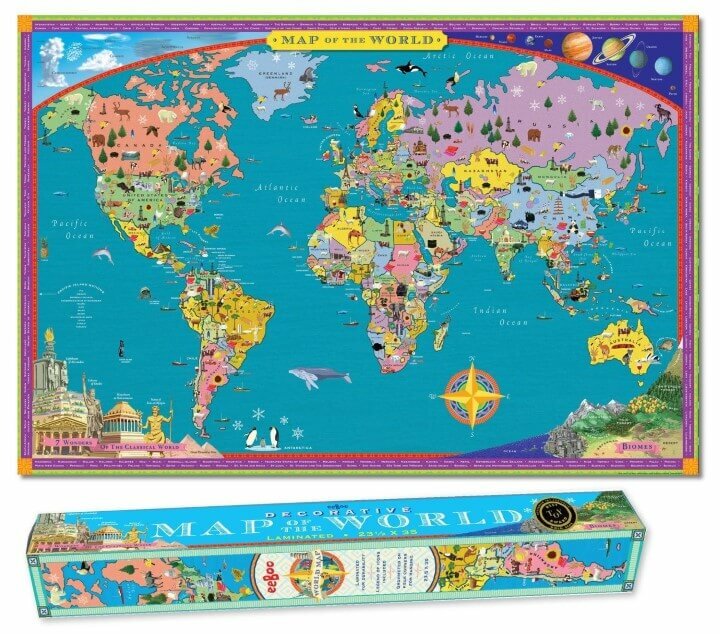 The peel and stick kids world map decal is also dry-erase. Your kids will love learning about the world and making their own notes on this giant map, which is also first-rate for educational classroom decor. 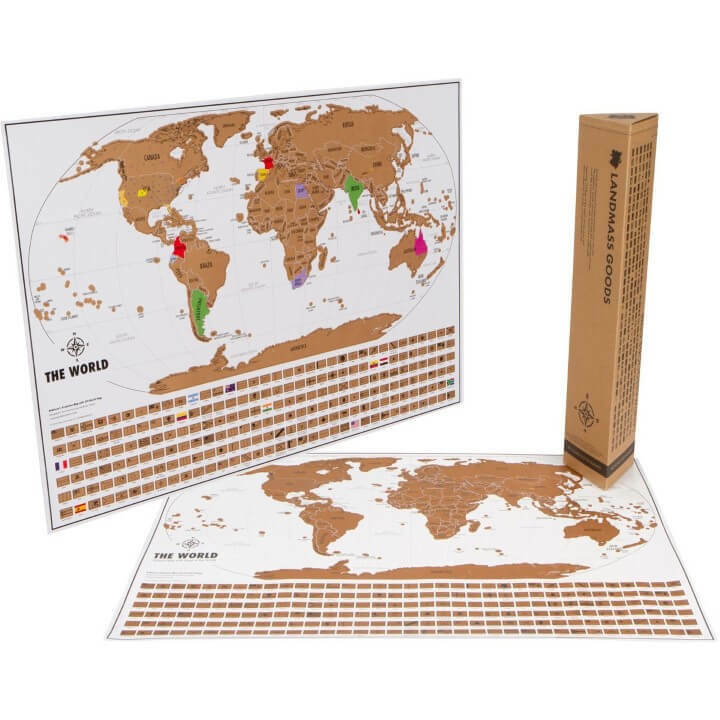 This kids World dry erase map is 36″ x 24″. WallPops are repositionable and always removable. 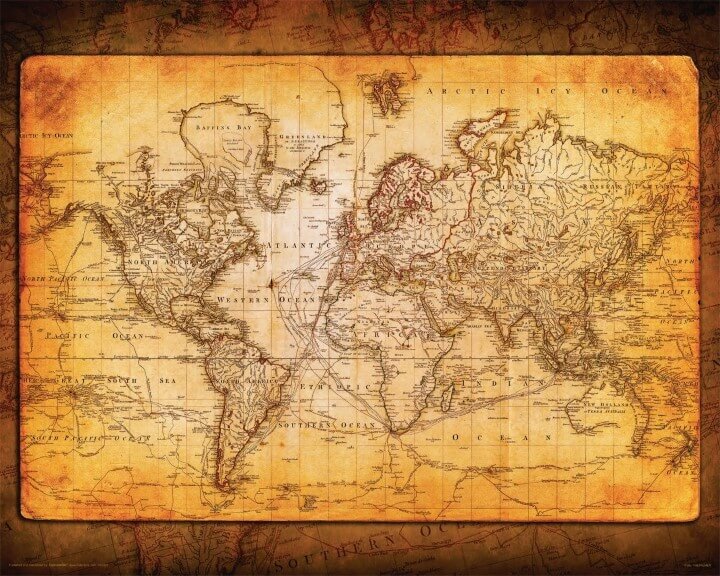 Description: Beautiful reproduction art style poster of an old world map. The excellent renaissance style art poster is suitable for framing. 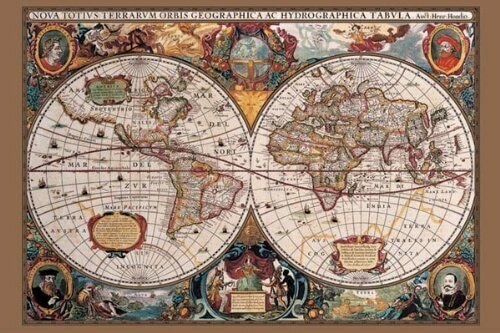 Description: Bacon’s Standard Map Of The World – Vintage 18 inch x 27.5 inch Full Size Poster. High Quality. Perfect for Framing. Description: Brand New 24″ x 36″ poster. Description: Photographic Print. 10″ x 8″ inch (25x20cm) Print. 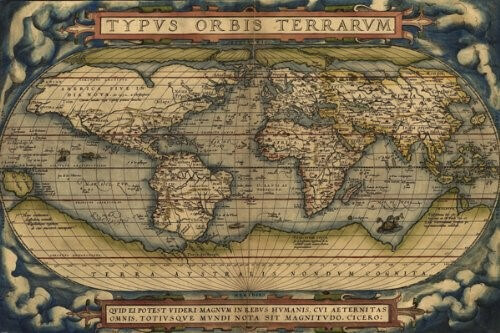 Artwork depicting 16th century Map of the Worldc. 1531. Description: Enjoy a taste of the Golden Age of Travel with these beautiful Fine Art Prints by Pacifica Island Art. This print will look wonderful framed in the home, office or restaurant and is perfect for the Travel Poster art collector. Beginning around 1935, Boucher designed an impressive series of posters for Air France that he continued producing until he was well into his seventies. Boucher is known mainly for his absorbing Air France poster designs; known as “Monsieur Planisphere” (planispheres are flattened representation of planet earth) he created a variety of illustrated World Maps that depicted the global flight routes serviced by the airline. 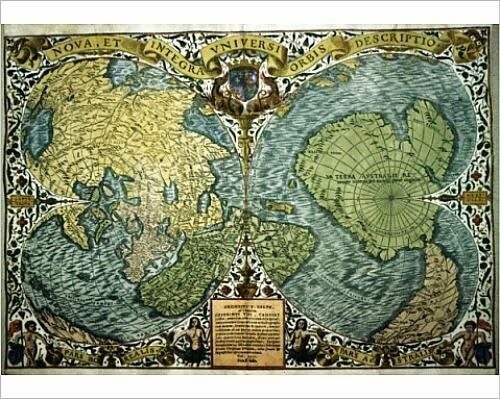 Description: World Map (Antique) Art 24″ x 36″ Poster. High Quality. Perfect for Framing. 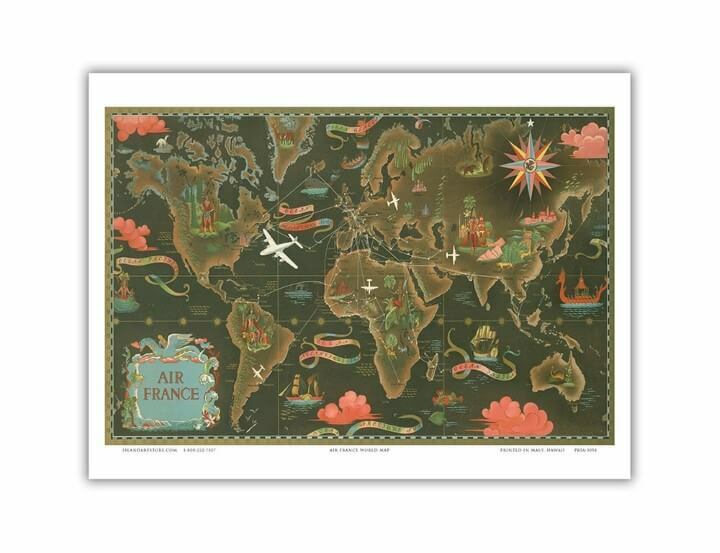 Description: This Print is a vintage style world map. Description: Keep track of where you’ve been and where you still want to go with a pin for each destination! A minimalist design combined with that industrial grunge vibe! It’s inspired by old blueprints, scratched slate, chalkboard art, and modern boldness, while still providing current information. 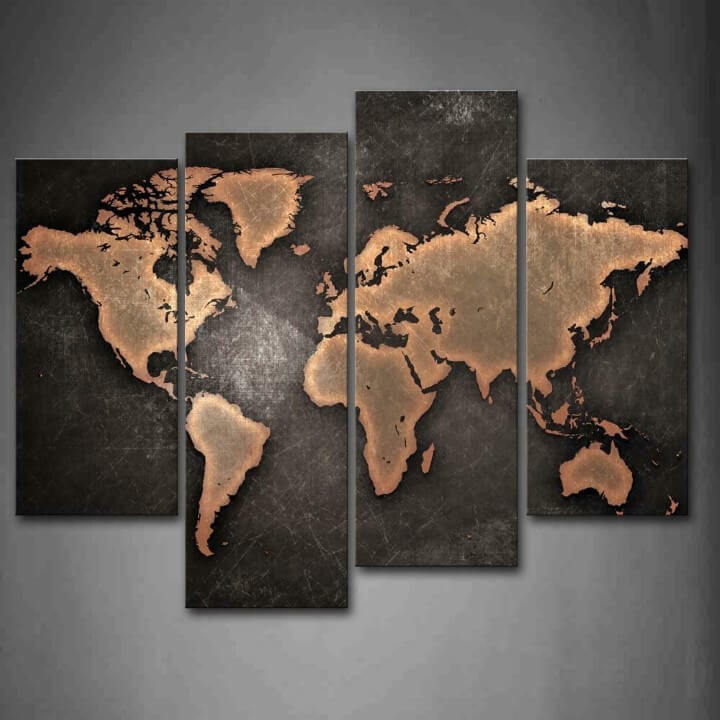 The dark background and light graphics contrast each other to make a map that stands out and compliments your home decor! It features a ¼” sheet of cork so you can put any type of push pin into it you would like! 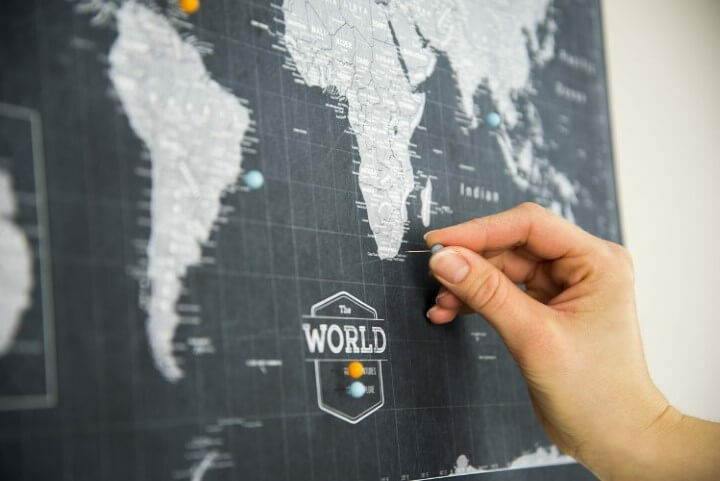 Description: Pin your world travels with this gorgeous Push Pin Travel Map. 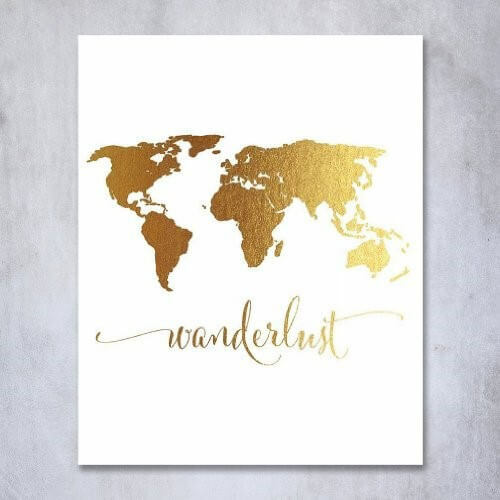 It’s not only a fun and unique way for you to track your past travels and plan out future adventures, it is also a beautiful art-piece for your wall. 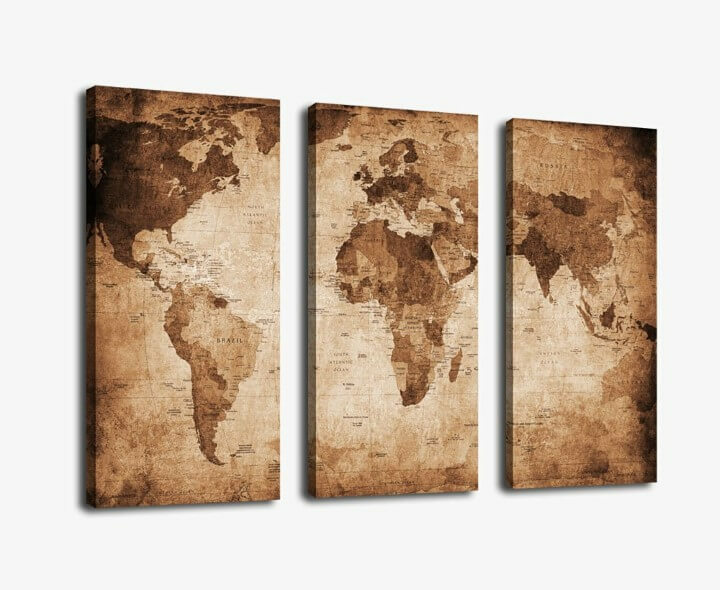 The neutral, warm tones of this world map make it an excellent choice for any home, office or study. 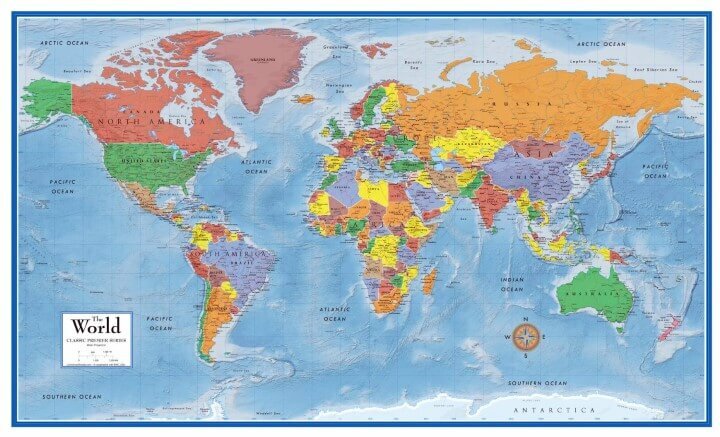 This map is up to date and has the capital of each country highlighted with a star. Each map is professionally finished in a 2 inch brown wood composite frame with a foamcore and cardboard backing for durability. 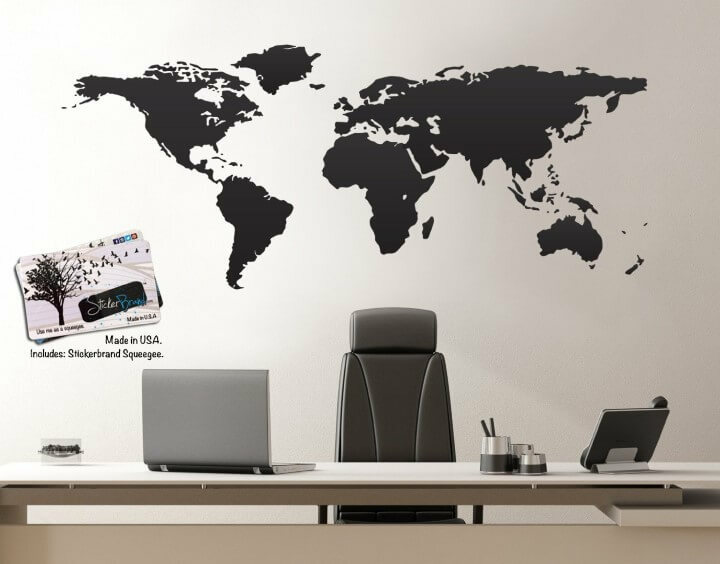 Description: A stylish way to decorate any wall while displaying your life’s many journeys. Pin all of your past travels and plan out future destinations. 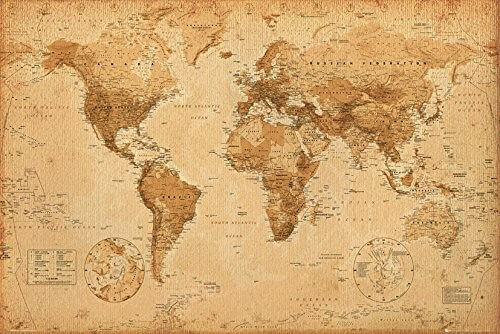 The experts at National Geographic have designed this exceptionally detailed up-to-date map in rich colors that give it a unique antique look that will match almost any décor. 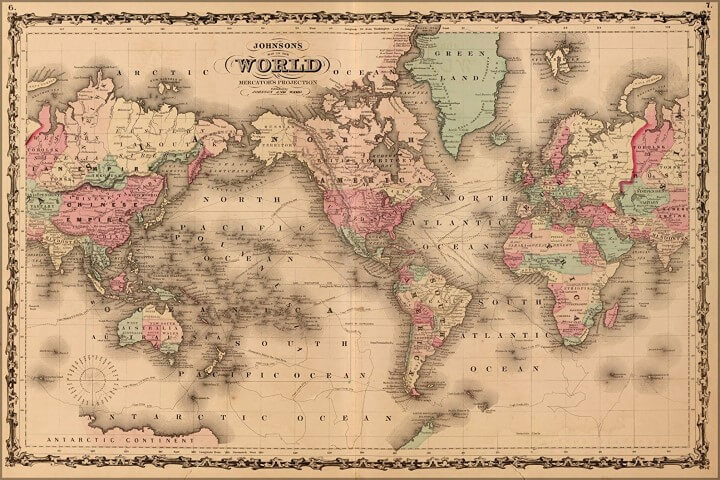 The ultimate conversation piece, this map is perfect for any home, office, classroom or business. 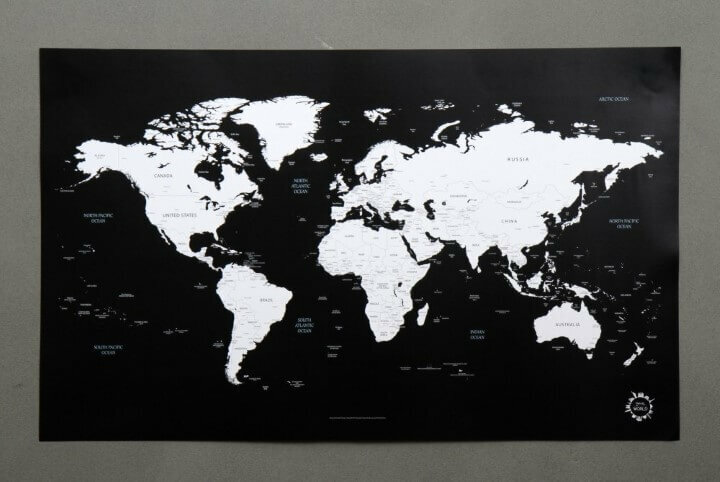 The map is mounted to sturdy foamcore board and professionally finished in a classy 2″ smooth glossed black frame to ensure it makes a splash on any wall. The completed size of the framed map is 39.5″ Wide x 27.5″ High. 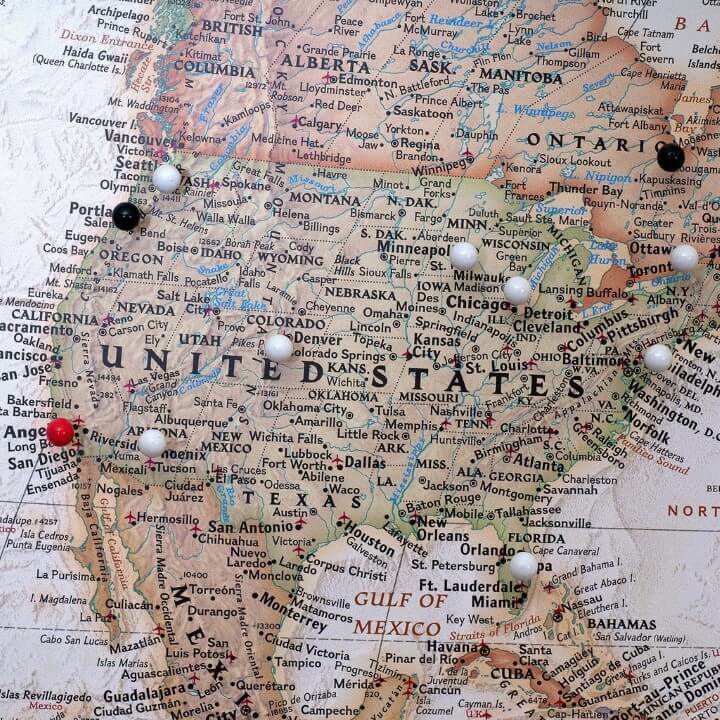 Each map will arrive ready to hang with a mixture of 100 pins in red, white and black to get you started. Use each color according to your own preference. Description: This ready to hang, gallery wrapped art piece features an urban watercolor map by Michael Tompsett. Description: Giclee artwork, print on the premium artist canvas.Gallery wrapped and stretched with wooden frame on the back. Each panel has a black hook already mounted on the wooden bar ready to hang out of box. Description: Made with gorgeous luxe gold foil and premium pure white matte card stock. 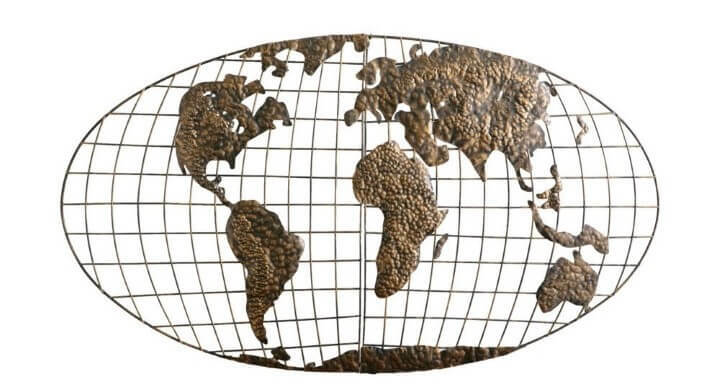 Description: This decorative map of the earth is the perfect accent for any décor. This handsome, “goes anywhere” wall sculpture has a 3D construction and is crafted from metal for durability. Dimensions include: Overall: 46″ W x 3″ D x 25.5″ H. This one-of-a-kind item approximately weighs 10 pounds. Only quality materials and manufacturing will do. Product materials include: metal. Assembly: Required. Description: 22.375″ x 34″ wall poster. Description: Track your travels with this cool map. 35.9 X 21.8 inch. 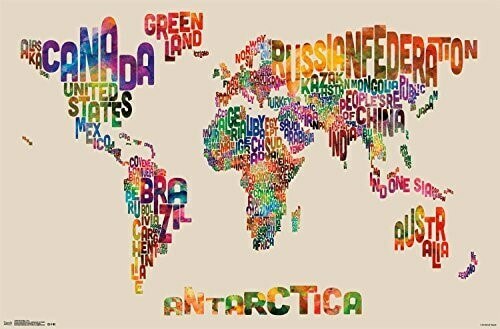 Description: Chalk Map of the World Blackboard Art Print Poster 34″ x 22″. Description: The map for your future dreams. 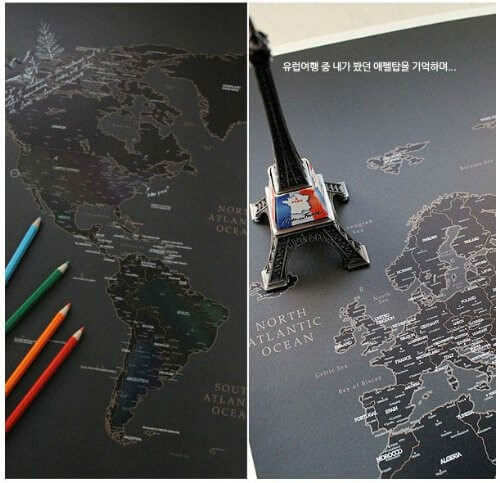 Black World Map Poster Draw your Dreams around the World. 36.61 in x 24.40 inch. 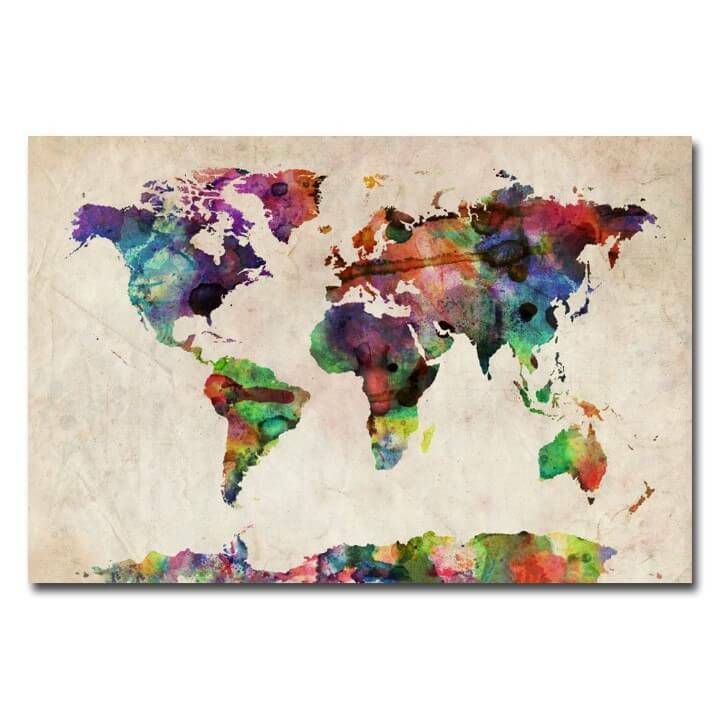 Description: The Decorator style World map uses a vibrant color palette that fills each country for easy identification and stunning shaded relief that will stand out as a beautiful piece of cartographic artistry. Drawn in the Winkel Tripel projection, distortions are minimized and unlike many other World maps, Greenland is show the same size as Argentina and not as the size of all of South America. Description: (Note Laminated version of the map above). Map centered on Africa allowing viewers to see continents complete and intact. Clearly labeled country and city names for easy location Latitude and longitude indications. Product dimension: 50″ x 32″. 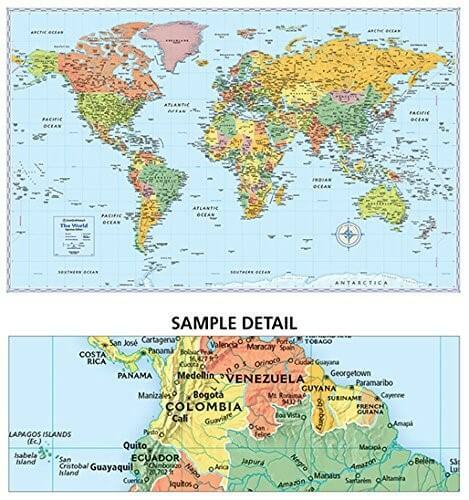 Description: Maps International’s World Political Wall Map really is huge! It is the largest single sheet map available to buy. Politically colored world wall map features every country as a different color. 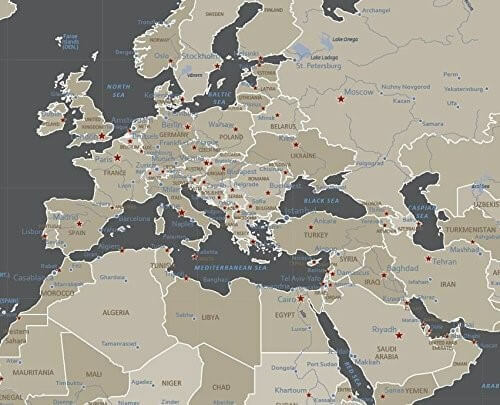 All major towns and cities are featured on our huge map and capital cities are clearly marked. 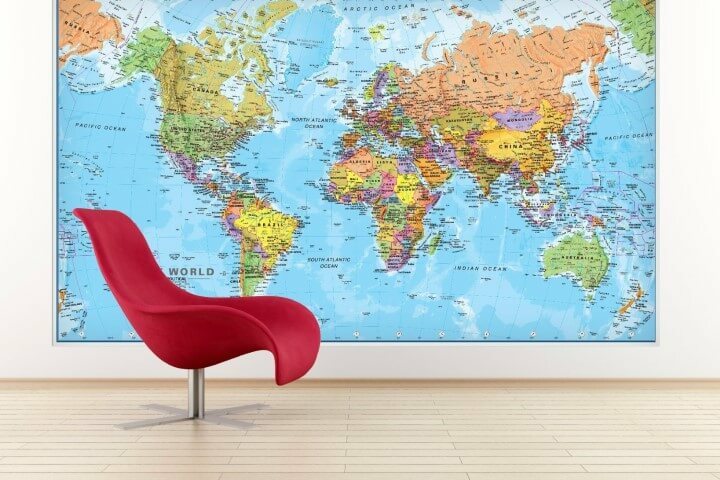 Hill and sea shading add to the vibrant overall effect in this huge political world wall map. Description: This art work comes already framed ready to hang, each panel has a wide hook already attached for easy hanging. Each Panel is 14 x 30 inches (30×75 centimeters), total 3 panels. 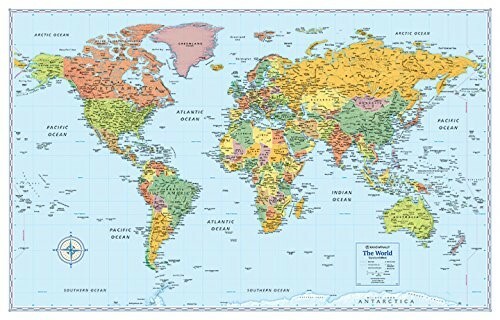 Description: World Map Political Classroom Educational Giant Poster 55″ x 39″. 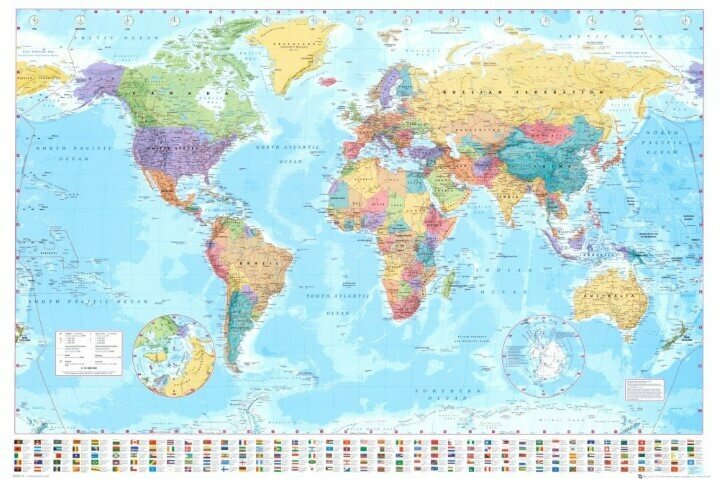 Description: This full color political world map is printed in with high quality ink on self adhesive vinyl and laminated for use with dry erase markers. Just peel off the paper backing and apply to any smooth primed surface. Works on painted walls, glass, smooth metal surfaces. The map is current with all recognized country borders as of 2015, including South Sudan. Indicated on the map are Countries, Country Capitals, Major Cities, Islands, Bodies of Water, State and Province Capitals for the United States and Canada. Unlike other dry erase maps this graphic was created specifically for use with Dry Erase, minor information was omitted for easier readability and customization by the user. Description: Wall decal stickers are mess-free, no paint, no glue/paste, no residue. They are more affordable compare to hiring a painter. They are much safer than wallpapers and Removable but not reusable. This Stickerbrand Vinyl Wall Decal is 30in Tall X 75in. 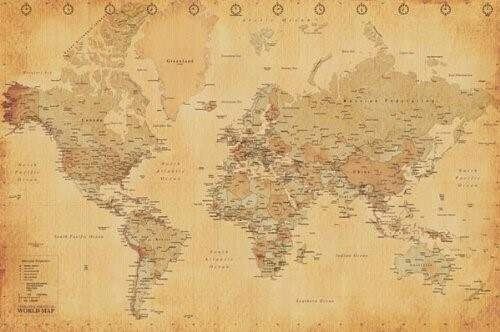 Description: Landmass’s World Travel Tracker Map – Scratch off where you’ve been and plan your next trip! 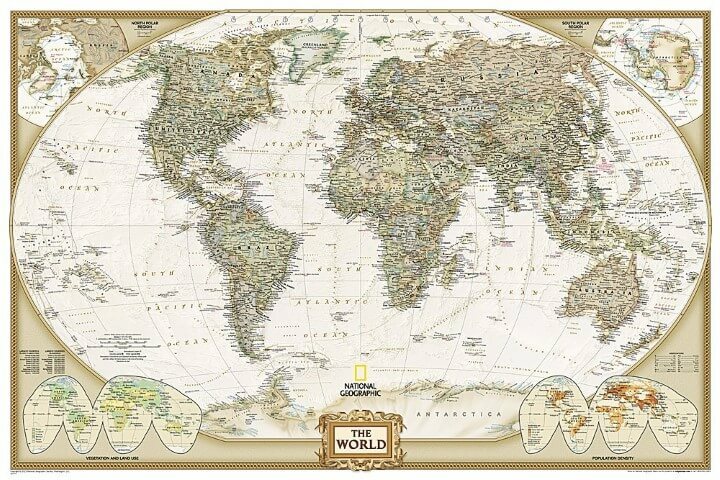 The Landmass Goods world map has a gold top foil area, much like a scratch ticket, with vibrant colors underneath. The map is an ideal size at 17 x 24 inches. You can find a frame for it on amazon, or use metal clips for vintage look. Featuring 210 flags of the world, terrain data, and state outlines for Australia, Canada and the USA. The Travel Tracker Map makes a perfect gift for the traveler in your life. Do you have a map of world religions? I might have some things…. PM me if you’re still looking for this. These are so nice! I have the Vinyl Wall Art world map on my living room wall and a black and white map from my hometown in bedroom. The other map was bought from Alvar Carto. Looking for a yellow and grey map of the world. About 2.5-3metres long and about 1m width??? Do you do anything like this? My 10 year old granddaughter has been looking for a world map. She has pen pals all over the world. Do you ever send them out free? Looking for a world map with South at the top. Saw one, and have a small version. Looking for a large poster size. Do you have a surname map of the UK?